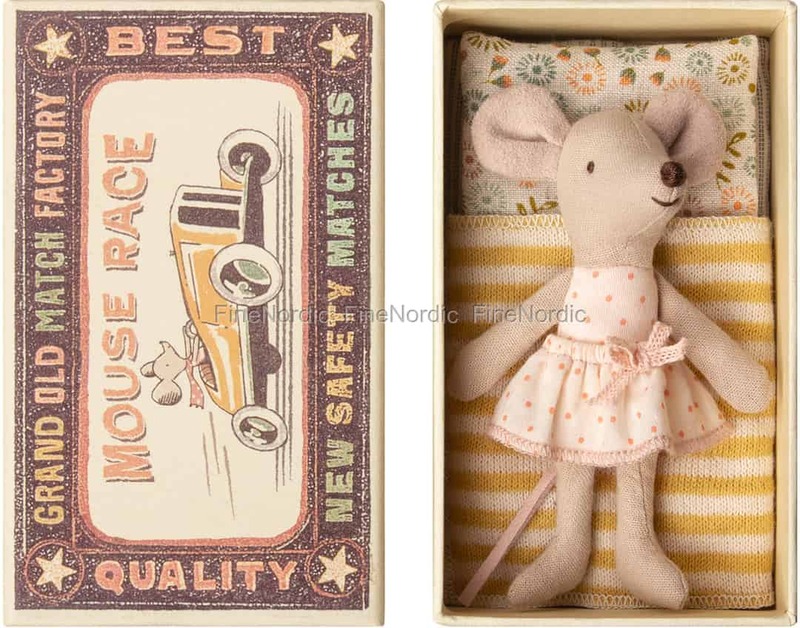 Maileg's Little Sister Mouse in Box is a cute little mouse in a pretty, sleeveless dress which is covered with happy dots. She made it really cozy for herself in that box by adding a blanket and pillow. At night, she always looks forward to climbing into her comfy box and getting all cuddled up under the covers. During the day she likes to play with her other mouse friends, but most of all with a little human friend. That’s when they tell each other exciting stories, they invite the other Maileg friends over for a tea party and they spend hours playing in the garden. Maileg’s little sister in box is a pretty gift idea for a Maileg fan, or for one who soon will become one. I adore the Maileg little sister mouse!!!!!!!!! !